Since June’s election of Hassan Rouhani, former President Hashemi Rafsanjani — the man behind the President-elect, after have been disqualified from the campaign — has been mounting a coded but notable challenge for political position. 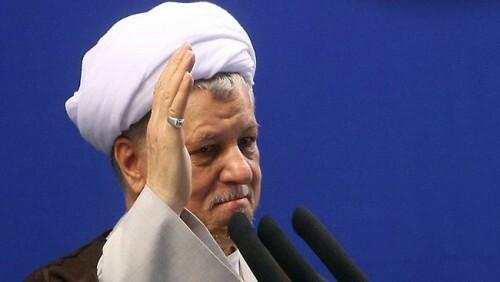 Last month, Rafsanjani went as far as to post a video extract from his July 2009 Tehran Friday Prayer — the last he was allowed to give — in which he supported the right of protesters to challenge the outcome of the Presidential election. Rafsanjani’s statement accompanied a PR campaign by his office to show the health and vibrancy of the former President, who turns 79 this month. On the social media network Cloob, Rafsanjani — or his team — uploaded photographs of the man, past and present. Several showed him in positions of authority, sitting with Rouhani, voting, or presiding over meetings. Most striking were the “action shots” responding to claims, just before Rafsanjani was blocked from standing in the June election, that the former President was not physically fit. The images on Cloob display Rafsanjani hiking along a river and riding a horse. Whatever the truth regarding his remarks on Israel on Friday, President-elect Hassan Rouhani has certainly opened himself up to international criticism — and perhaps played into the hands of those who have touted him as less of a “moderate” than he portrayed himself to be — by posting this photograph of himself in parade near a man holding a “Down With U.S.A.” banner (the Persian reads “Death To America”). The question remains — is Rouhani being politically naive, or playing up to hardliners? Mahmoud Ahmadinejad, who leaves the Presidency this weekend, used Quds Day for a farewell message that the question of Palestine is the question of saving humanity itself. Ahmadinejad said it would be “naïve” to think that the issue of Palestine could be resolved through “talks and divvying up a territory”. The outgoing President Ahmadinejad noted that the Israeli regime has been created for the final goal of dominance on the Middle East, accusing Israel’s “Western supporters” of sowing discord in Syria and Egypt to support that objective. Khatami continued by denouncing US-backed “compromise” negotiations for pursuit of the goal of “stabilizing, legitimizing, and creating a safe margin for the Zionist regime” in Israel. Minister of Intelligence Heydar Moslehi has said former President Mohammad Khatami cannot take part in the inauguration of Hassan Rouhani because of his role in “street riots” — the protests after the disputed 2009 Presidential election. Moslehi told reporters during Quds Day festivities that “leaders have no place in the country until they prove their adherence to the law”. What Did President-elect Rouhani REALLY Say About Israel Today? Friday’s headlines have been taken over by a political fight over comments made by President-elect Hassan Rouhani on Quds (Jerusalem) Day, specifically on the issue of Israel. We have now moved this story to a separate feature. New York-based NGO Human Rights Watch (HRW) on Friday sent a letter to President-elect Hassan Rouhani, urging him to take “concrete steps” to improve Iran’s humanr rights. Tamara Alrifai, HRW’s Middle East advocacy director said that Rouhani had appealed to voters’ desire for change by pledging to increase personal freedoms. “Now that he has a mandate from the people to push through necessary reforms, he needs to prove that his presidency is more than just campaign promises,” ALrifai added. The letter called on Rouhani to free political prisoners; support a moratorium on executions; remove media restrictions; expand academic freedom; unshackle civil society; respect women’s rights; guarantee minority rights; push for the eradication of inhumane practices; and cooperate with UN rights bodies. 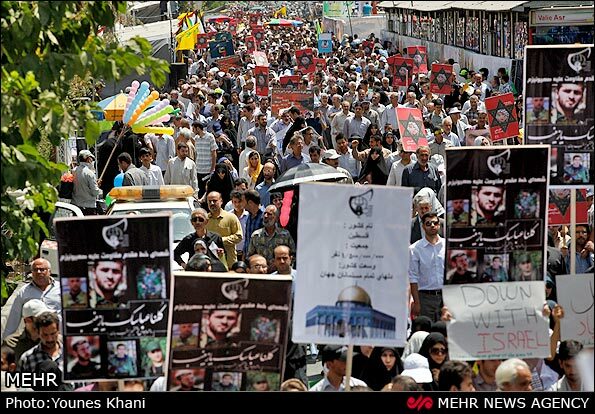 Today, Iranian media is focusing its attention on celebrating International Quds Day. For those outside the Islamic Republic, Quds Day — the last Friday of Ramadan — is an opportunity for Iranians to show solidarity with Palestinians and opposition to Israel. It takes its name from Qods, or al-Quds, the Arabic name for Jerusalem. Photographs from the event don’t quite match the official estimations — compare these crowds to recent demonstrations in Cairo or the 2009 post-election protests in Iran. In both its English and Persian outlets, Fars News joins the celebrations, adding a twist by claiming the solidarity of Iranian Christians with the Palestinian people. Not to be outdone, Mehr News leads with the same headlines as Press TV — and the exact same articles claiming the great popularity of International Quds Day. While the day itself is confined to Iran, Mehr News also used it as an opportunity to demonstrate the unity of prominent political figures on the question of Israel and Palestine, by tweeting the remarks of outgoing president Ahmadinejad, president-elect Hassan Rouhani, and former president Hashemi Rafsanjani. Where Ahmadinejad makes direct, hyperbolic attacks on Israel, Rouhani and Rafsanjani express solidarity with Palestinians. #Rouhani: #Quds_day is an indicator of global unity against oppression. 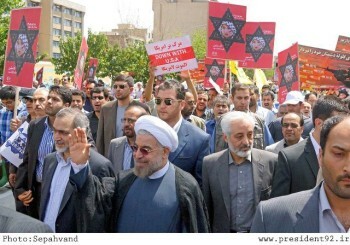 Rouhani also tweeted pictures of himself at a march in Tehran. See if you can spot him. PreviousMiddle East, August 2: Egypt — More Protests, More Deadly Clashes?